Star Trek actor and director Leonard Nimoy has died at the age of 83. Are you a fan of Star Trek? Did Star Trek or the Mr. Spock character have any influence on your life? If so, in what way? Please share your comments and memories. I've been a Star Trek fan since my early grade school years, watching the original series in my bedroom on an old black-and-white rabbit-ears TV. Since then, I've seen every Star Trek episode in every Star Trek series (no overstatement) over the years. It was Mr. Spock and Star Trek that first sparked my lifelong interest in science, technology, knowledge, logic and reason. Me too GM. Mr.Spock, Bones, Kirk, and the crew member in the red jersey that always bought it. Watched it on a black and white set in my bedroom. Then watched the re-runs over and over. Then the movies, "The Wrath of Khan" was my favorite, got misty when Spock bought it and told Kirk, "I have and always will be your friend". Hung out with a set of twins that collected comics, watched Star Trek, and made Star Trek action figures out of pipe cleaners. We dressed up as Star Trek characters for halloween. This was the late 60's early 70's. Their grandmother made us the costumes on her sewing machine. Perfect. Favorite moment would be where he discovers his protégé has decieved him and he slaps the phaser away...followed quickly by a forced mind meld in the film Star Trek V: Undiscovered country. That's great Belle! 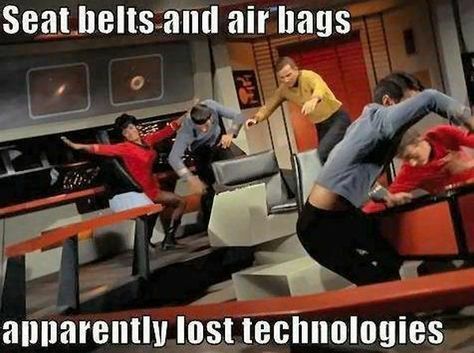 The one thing they missed back in the 60's...Seat Belts. The poor Captain Kirk and his crew were always getting tossed around all over the bridge with every photon torpedo hit, LOL. I seem to recall Captain Picard fastening his seat belt on the captain's chair during a bumpy scene. I don't remember details; probably some problem with the inertial dampeners. There have been many variants of the tricorder developed or being developed including smartphone apps and modular medical devices. Logic is the beginning, not the end, of Wisdom - Leonard Nimoy/Spock. Mr. Spock's logical analysis of events and circumstances actually set in motion changes in my own thought processes. I believe his character caused me to be more analytically inclined. I did find his lack of emotional understanding somewhat perturbing at times. He amassed an amazing collection of art works as a serious art afficinado and I wonder what will become of it. He will be missed. It was quite clever though, there are sayings that emotions are bad habits or slaves to your thoughts....another one is 'the sign of an intelligent people is their ability to control emotions by the application of reason'. But yes I found it perturbing too. There's a great scene in The Wrath of Khan at Spocks funeral where Kirk says 'out of all the souls he has encountered on his travels his was the most human'. "... You may find that having is not so pleasing a thing after all as wanting. This is not logical, but it is often true." One of my favorite episodes in that the Mr. Spock character exhibited emotion. Despite Bones tongue in cheek comments about Vulcans, and Mr. Spock in particular, i always felt Spock was funny. In an earlier interview, noted the Jewish origins of the geeting "Live long and prosper".